This article by the Cleveland Institute of Electronics is a sort of early infomercial in printed form. You probably know that 1960's was a time of major evolution in electronics with first the transition from vacuum tubes to solid state devices in the early part of the decade, and then from discrete component circuits to integrated circuits in the latter part. Plenty of skeptics swore that the newfangled fad would quickly fade out due to initially sky-high prices and low reliability of germanium and silicon devices coming from university and corporate laboratories. Actually, it was more a matter of hoping it would die out so that they would not need to re-train and buy new test equipment for their shops. Others welcomed and embraced the potentials of the new technology and were determined to get in on the ground floor, so to speak. 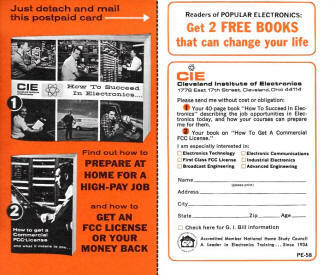 The Cleveland Institute of Electronics, an established and respected provider of self-study course material, quickly glommed onto the opportunity to train fellow futurists. 50 functions in a single chip. The junctions of 50 separate transistors, diodes, resistors and capacitors can now be formed by the tiny dot in the center of the integrated circuit held by the tweezers. The development of integrated circuitry is the dawn of a new age of electronic miracles. It means that many of today's job skills soon will be no longer needed. At the same time it opens the door to thousands of exciting new job opportunities for technicians solidly grounded in electronics fundamentals. Read here what you need to know to cash in on the gigantic coming boom, and how you can learn it right at home. Tiny electronic "chips," each no bigger than the head of a pin, are bringing about a fantastic new Industrial Revolution. The time is near at hand when "chips" may save your life, balance your checkbook, and land a man on the moon. Chips may also put you out of a job ... or into a better one. "One thing is certain," said The New York Times recently. Chips "will unalterably change our lives and the lives of our children probably far beyond recognition." A single chip or miniature integrated circuit can perform the function of 20 transistors, 18 resistors, and 2 capacitors. Yet it is so small that a thimbleful can hold enough circuitry for a dozen computers or a thousand radios. Miniature Miracles of Today and Tomorrow Already, as a result, a two-way radio can now be fitted inside a signet ring. A complete hearing aid can be worn entirely inside the ear. There is a new desk-top computer, no bigger than a typewriter yet capable of 166,000 operations per second. And it is almost possible to put the entire circuitry of a color television set inside a man's wristwatch case. Tiny TV camera for space and military use is one of the miracles of integrated circuitry. 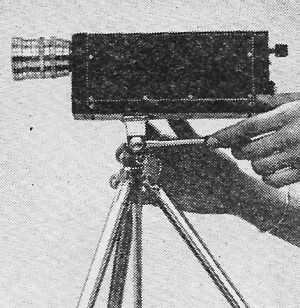 This one weighs 27 ounces, uses a one-inch vidicon camera tube, and requires only four watts of power. Soon kitchen computers may keep the housewife's refrigerator stocked, her menus planned, and her calories counted. Her vacuum cleaner may creep out at night and vacuum the floor all by itself. Money may become obsolete. Instead you will simply carry an electronic charge account card. Your employer will credit your account after each week's work and merchants will charge each of your purchases against it. When your telephone rings and nobody's home, your call will automatically be switched to the phone where you can be reached. Doctors will be able to examine you internally by watching a TV screen while a pill-size camera passes through your digestive tract. What does all this mean to someone working in electronics who never went beyond high school? It means the opportunity of a lifetime - if you take advantage of it. It's true that the "chip" may make a lot of manual skills no longer necessary. But at the same time the booming sales of articles and equipment using integrated circuitry has created a tremendous demand for trained electronics personnel to help design, manufacture, test, operate, and service all these marvels. There simply aren't enough college-trained engineers to go around. So men with a high school education who have mastered the fundamentals of electronics theory are being begged to accept really interesting, high-pay jobs as engineering aides, junior engineers, and field engineers. You can get the up-to-date training in electronics fundamentals that you need through a carefully chosen home study course. In fact, some authorities feel that a home study course is the best way. "By its very nature," stated one electronics publication recently, "home study develops your ability to analyze and extract information as well as to strengthen your-sense of responsibility and initiative." These are qualities every employer is always looking for. If you do decide to advance your career through spare-time study at home, it makes sense to pick an electronics school that specializes in the home study method. Electronics is complicated enough without trying to learn it from texts and lessons that were designed for the classroom instead of correspondence training. Want to know more? 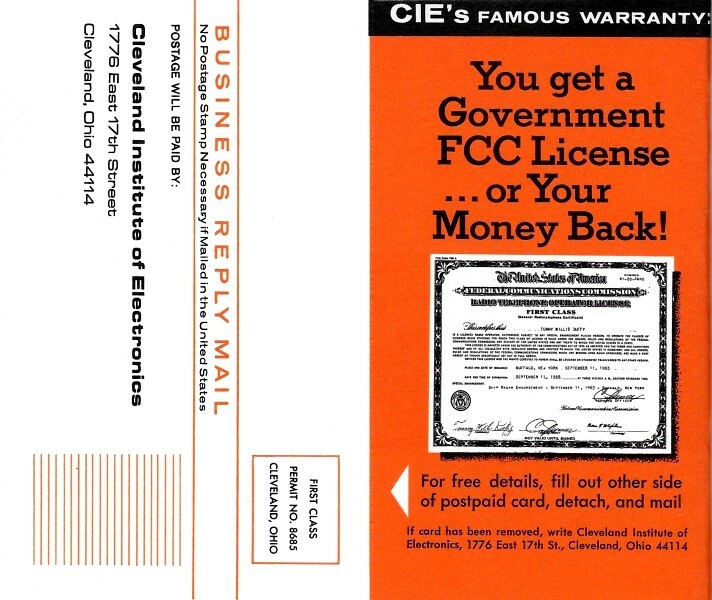 The postpaid reply card bound in here will bring you a free copy of our school catalog describing today's opportunities in electronics our teaching methods, and our courses, together with our special booklet on how to get a commercial FCC License. If card has been removed, just send us your name and address. 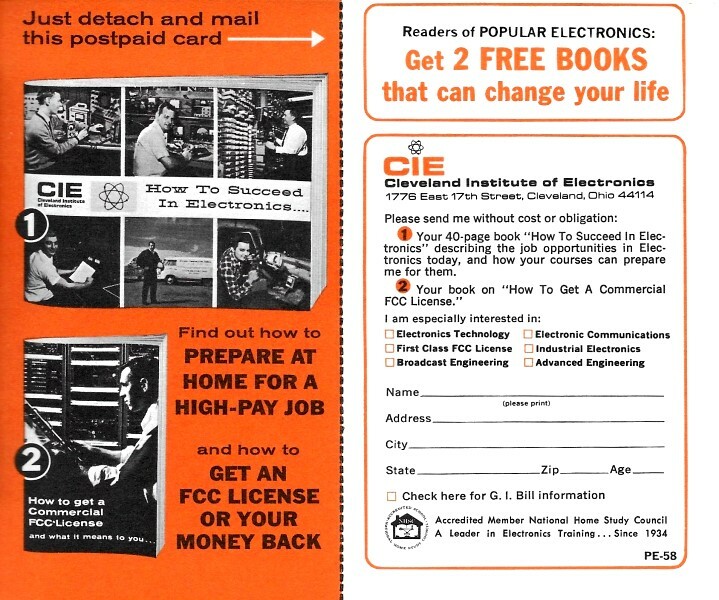 The Cleveland Institute of Electronics has everything you're looking for. 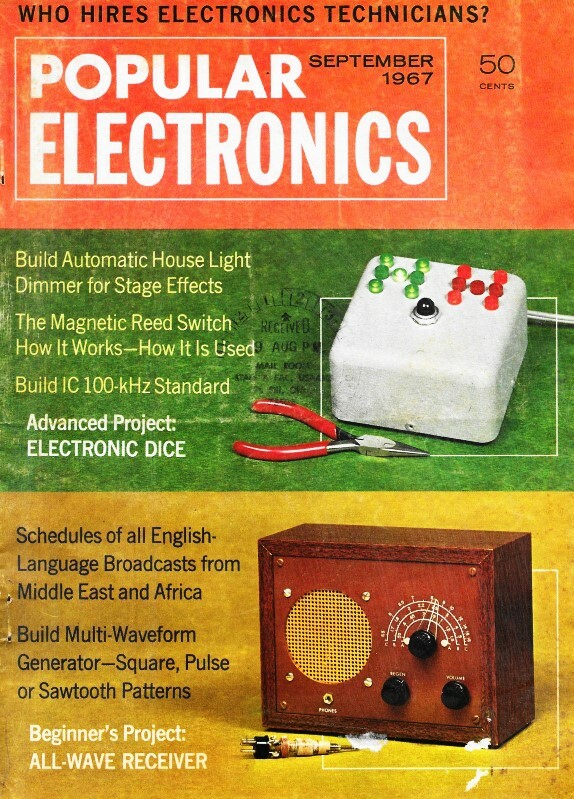 We teach only electronics - no other subjects. And our courses are designed especially for home study. We have spent over 30 years perfecting techniques that make learning electronics at home easy, even for those who previously had trouble studying. Your instructor gives your assignments his undivided personal attention - it's like being the only student in his "class." He not only grades your work, he analyzes it. And he mails back his corrections and comments the same day he gets your lessons so you read his notations while everything is still fresh in your mind. Because of rapid developments in electronics, CIE courses are constantly being revised. Students receive the most recent revised material as they progress through their course. This year, for example, CIE students are receiving exclusive up-to-the-minute lessons in Microminiaturization, Logical Troubleshooting, Laser Theory and Application, Single Sideband Techniques, Pulse Theory and Application, and Boolean Algebra. For this reason CIE courses are invaluable not only to newcomers in Electronics but also for "old timers" who need a refresher course in current developments. Praised by Students Who've Compared Students who have taken other courses often comment on how much more they learn from CIE. Mark E. Newland of Santa Maria, California recently wrote: "Of 11 different correspondence courses I've taken, CIE's was the best prepared most interesting, and easiest to understand. I passed my 1st Class FCC exam after completing my course and have increased my earnings $120 a month." 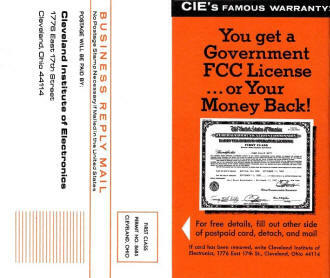 No matter what kind of job you want in electronics you ought to have your Government FCC License. It's accepted everywhere as proof of your education in electronics. And no wonder - the Government licensing exam is tough. So tough, in fact, that without CIE training, two out of every three men who take the exam fail. But better than 9 out of every 10 CIE-trained men who take the exam pass ... on their very first try! This has made it possible to back our FCC License courses with this famous Warranty: you must pass your FCC exam upon completion of the course or your tuition is refunded in full. All CIE courses are available under the new G.I. Bill. If you served on active duty since January 31, 1955, or are in service now, check box on reply card for G.I. Bill information.